The incorporation of polyunsaturated fatty acids (PUFA) in body lipids influences the fluidity of body cells and their capability to form prostaglandins (PG) (Adam and Wolfram, 1984). Recent work has shown that the intake of PUFA has implications on PUFA incorporation (Zöllneret al., 1979), desaturation (Bloj et al., 1973) and PG formation (Adam et al., 1986a,b), which is essential for proper cell function. 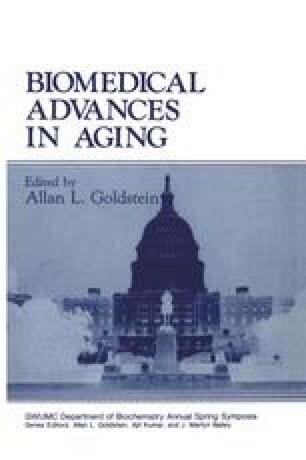 Aging is a cellular event that may result in impairment of membrane-bound enzymes regulating PUFA metabolism. The objectives of this study were to compare in a group of young adults and in a group of aged persons the incorporation of linoleic acid into plasma lipids. By measuring the elongation product, arachidonic acid, we were able to estimate the activity of the rate-limiting enzyme in this process, the delta-6-desaturase. Finally, we monitored PG formation by measuring the joint urinary metabolite of PGE, PGF, and PGD in 24-hr urine.